The Chromatics are a musical group who are promoting astronomy with a difference. Lydia spoke with Padi Boyd, the music director for the group. The Chromies (as they call themselves) have written astronomically correct a cappella songs to be used in classrooms for a project called AstroCappella. Lydia read about the Chromatics online and found out that they have presented their normal repertoire at the Kennedy Center's Millennium Stage, at First Night Annapolis; took third place at the Atlantic Region Harmony Sweepstakes in 1999, they sang the National Anthem for the Baltimore Orioles; and also performed holiday music at the White House's candlelight tours (1996). Your CD has flown in space. Padi, what an honour! How did you manage that? "One of the guys who used to sing with our group works in the department that trains the astronauts on the use of specialized tools during their space walks to refurbish Hubble. He told John Grunsfeld, one of the Hubble repairers, about AstroCappella. John was intrigued because he's a high energy astrophysicist by training. 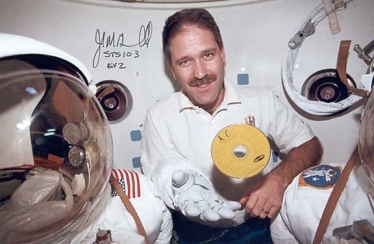 So he took the CD onboard in his personal pack for the servicing mission. We were thrilled!" The Chromatics' latest CD is also a CD-ROM featuring 13 songs about the universe in addition to learning activities for the classroom. "Yes, we're very excited to have just released this collection. Each song has extensive supporting material on the CD-ROM to help teachers use them in their classrooms - illustrated background information, detailed, teacher-tested lesson plans, fun activities for students to do on their own, as well as videos, slide shows, games and puzzles." This is a picture of the disc in space. 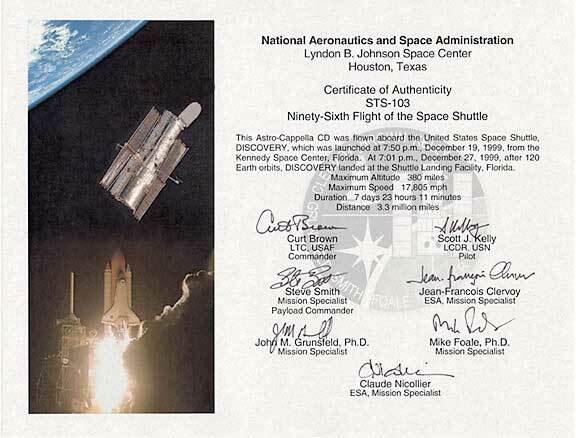 You can also view the certificate from NASA confirming the disc's spaceflight. Tell me, how did the band get together? "The Chromatics came into existence in April of 1995 as the offshoot of a former group, mostly from NASA's Goddard Space Flight Center, who got together to sing a cappella and have fun. Currently most of the Chromies are involved in space science in one way or another. I am an X-ray astronomer, and so is Alan Smale (our bass). Soprano Karen Smale is a Web designer with a background in solar physics and astronomy. The three of us work in Goddard's Laboratory for High Energy Astrophysics through various contractors. Alto Lisa Kelleher is a financial analyst at NASA Headquarters and John Meyer (tenor) designs and builds the power systems for space science missions at APL (he was involved in the NEAR power system, and is currently supporting a French payload which will launch soon). Deb Nixon (soprano), is a computer systems administrator for a law firm, and Paul Kolb (baritone) is connected to space science via his wife, who works for the NASA contractor Computer Science Corporation. So we're all techie, mostly in a space way." Can you give me an idea of how the band decided to promote astronomy through its music? "Part of my job in the lab here involves education and public outreach. In 1995, I was the coordinator of our outreach group here, which is made up of volunteers in the lab who give some of their time to help bring the universe to the public. When I was researching grants, I came upon the NASA IDEA's grant program, a small program that gives seed money to innovative astronomy educational programs. In a very informal conversation, I brought up the idea of writing songs about astronomy and going for one of these grants. It was very tongue in cheek at the time, but once we started talking about it, we all started recalling entire Schoolhouse Rock songs from 15 years ago. "We did a little research and confirmed what our guts told us already: that music is an incredibly powerful way into a person's mind and memory. We joined forces with a middle school math teacher, Kara Granger, who worked on educational projects with our lab. Together we came up with the idea of a short CD with five or so songs, and an activity to go along with each song, to be used in the middle school math or science classroom. AstroCappella was born. That was May 1997." What is your educational philosophy? What do you hope to accomplish with introducing songs into the math and science classroom? "I'm committed to the idea that students and the general public have a right to learn about and enjoy our modern picture of the universe. For centuries, people have been fascinated with the universe, and Earth's and humanity's place in it. We've learned so much about our solar system, our galaxy and the universe, but many times the most exciting, most thought-provoking ideas, don't make their way to students, and the taxpayers who are footing the bill. "Even in my lifetime, we've made such enormous strides in our knowledge of the Solar System. Starting with the lunar landings, we've been exploring our neighbour planets with ever-increasing technology, and finding out all kinds of new things, big and small. We've tried to get this sense of awe, and of continuous learning, into the AstroCappella project: the Pluto (planet or Kuiper Belt object?) controversy makes an appearance in the song Nine Planets. The expanding universe is mentioned in several songs." How rewarding has it been working with classroom teachers to develop the songs and materials? "All along the way we've had strong and very fruitful interactions with educators. As the project has grown, we've always listened to what teachers told us and incorporated their suggestions into the songs and activities. In fact, our latest songs, which appear for the first time on AstroCappella 2.0, were composed in response to a large teacher demand for songs about the Earth and the Solar System - topics that are widely taught in science classrooms at every level. Teachers are enthusiastic about getting technology into their classroom." So, the CD is not merely music? "AstroCappella 2.0 is also a CD-ROM containing extensive illustrated background information for each song, as well as classroom lesson plans, self-guided activities, slide shows, science music videos, glossaries, and more. Teachers can use the information on the CD-ROM to reinforce the concepts in the songs (and the curriculum!) in a variety of ways, while simultaneously using computers in their classroom to enhance their own presentation. "We've made an effort to collect unconventional classroom activities. Since food is a proven motivator for kids, we have several activities with tasty edible results. Convection in the Sun is demonstrated with Miso soup, the solar system is toured using scale model objects such as oranges and peas, and the habitable zone near the Sun is discussed using make-your-own ice cream and chocolate fondue. There's also a recipe for a comet - which is not edible!"